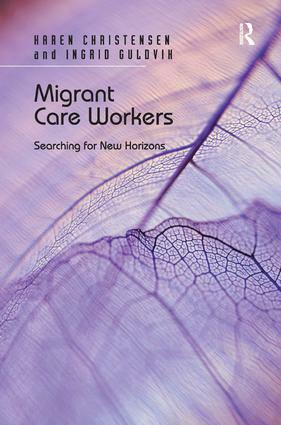 In this beautifully-argued book, Karen Cristensen and Ingrid Guldvik provide a comparatively-based insight to the historical context for public care work and show how migration policies, general welfare and long-term care policies (including the cash-for-care schemes) as well as cultural differences in values in the UK and Norway set the context for how migrant care workers can realise their individual life projects. Through viewing migrants as individuals who actively construct their lives within the options and conditions they are given at any time, they bring to the discussion an awareness of what might be called ’a new type of migrant’ one who is neither a victim of the divide between the global north and the global south, nor someone leaving family behind, but individuals using care work as a part of their own life project of potential self-improvement. Karen Cristensen, University of Bergen, Norway. Ingrid Guldvik, Lillehammer University College, Norway.